Learning to Make New Pals…. I meant to post this earlier but I was feeling the puppy laziness syndrome lately…. Besides, internet here is extremely horrendously bad! 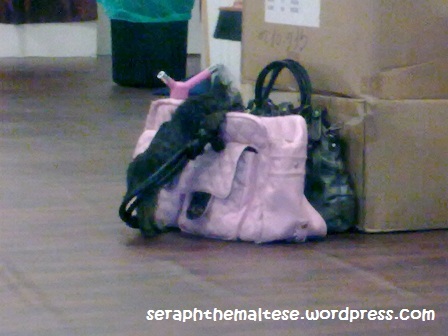 Last weekend mommy brought me to a friend’s petshop to mingle with their maltese there…. Me being me, I was absolutely timid, not daring to join them in their adventures…. They came to sniff me but soon find me a boring furball…. 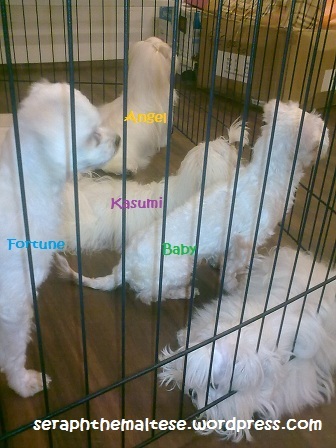 Besides, the maltese there were all older than me other than 1 puppy who is elder by a month or so…. Those old ladies wouldn’t be interested in pesky puppies like me i suppose…. Angel was the alpha there, holding her head up high…. What an aura…. I felt so intimidated! Fortune was kinda aloof but she enjoys attention once a while…. Baby stayed with mommy for a week once, so she was excited to meet mommy again…. Stepping all over me as she tries to get close to MY mommy! Kasumi is the puppy I mentioned…. She is the direct opposite of me…. Fear for humans, not dogs! Mommy kept urging me to join them but I was more interested in finding comfort zone…. At the end of the session, mommy said she would try to bring me out to meet more doggy pals often…. Imagine the shock I recieved from hearing that! There was also a kitten running around there…. See what she tried to do to my bag! And if you’re wondering whether did it succeed, yes it did! It snuggled up inside my bag until mommy carried it out…. Oh my! What an adorable kitten!